It was an uncharacteristically warm January night when I returned to Goucher after five months of living and traveling abroad. The night had a surreal clarity to it; the buildings stood out sharply in the darkness. My Uber ride from the airport landed me in front of the Alumnae/i House, from which I slowly made my way to Van Meter, lugging my suitcase along the familiar brick pathway. The Athenaeum beamed in its artificial brilliance; it was familiar, yet I stared for a halting minute, convinced I had never seen the building before. I stopped before the end of Mary Fisher, near the door to Dulaney. The academic quad glittered in the glow of the tall sidewalk lamps. It was quiet, as a Goucher night is so often quiet – when you can’t be sure if there’s anyone really on campus at all. A distant figure began to approach, gliding down Van Meter from Stimson. The figure moved with confidence, a majestic flight I knew so well. Meg John. My roommate emerged from the shadowy distance, embracing me in a hug of world-saving capacity after our nine months apart. With the warmth of her smile and glowing welcome, the campus began to regain its feeling of home. 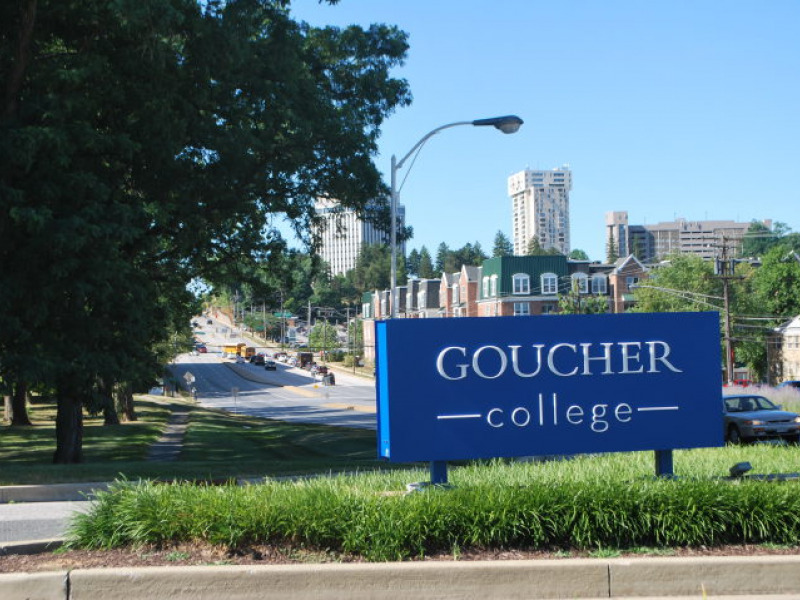 Goucher’s emphasis on study abroad doesn’t just mean that students have the chance to spend three weeks or a semester living and studying in another country. It also means that these students are returning to Goucher after having a myriad of experiences that stimulate a variety of needs. Here we explore some of those needs, and questions that arose in our process of reentry. One of the things I needed most when being back at Goucher after study abroad was time. Through this need of time, I realized how study abroad has been a part of my experience at Goucher. Though I can distinguish my time abroad and my time at Goucher, there is a certain level of connection that exists to bind the two in their collective reality of my undergraduate experience. How do we return from an experience “abroad”? How do we share it? Who do we become when we return? And what do we need? “Returning to Goucher,” Rachel Grosso ‘18, shared, “I really needed a bicycle and a place like home to be cozy and chat with other people. Danes have a cultural value called ‘hygge’, which is basically coziness and comfortability. Often found by cuddling up, being with good friends, enjoying non-controversial conversation, maybe a warm drink, and some fuzzy socks. I needed that when I returned here.” These responses answer the question of how we incorporate our experiences back into our time at Goucher. We need something we felt was lost on that plane ride home. Needing time was something I recognized mostly in hindsight. I needed time to process my experiences abroad, and in returning to Goucher I needed time to process what it meant to be back in a familiar and comfortable place. Moreover, I needed someone to tell me that it was okay where I was – it was okay for me to feel angst about Goucher, it was okay to want to talk about changes to the system of study abroad at Goucher, it was okay to want to sit alone and think and feel whatever arrived in those moments. Reentry into Goucher’s bubble was allowed to be bumpy and messy and bittersweet. But at the same time it was okay for returning to feel normal, uneventful. As Madeline St. John ‘18 said, “I was also kind of in the space of I’m just ready to be back at Goucher and not really thinking about abroad.” Some days that’s exactly what I wanted too. Many of us have returned to Goucher from study abroad experiences. Maybe we’ve changed, maybe Goucher has changed, or maybe nothing has changed and we’re back in the swing of things before we know it. That night I returned to Goucher’s campus for the first time, my roommate and I made our way into Dulaney, up to the third floor double that was to be our room for the rest of the semester. Both of us back at Goucher from semesters abroad, we spent that spring semester challenging each other with questions of what it meant to be gone, and what it meant now to be back. Her presence made my reflection process possible in ways I didn’t know it could be. There are still questions, there are still reflections, and I continue to learn.